I can’t believe it has been and gone. The first ever JCS Digital Literacy conference #JCS2018 in Birmingham was a huge success. Wonderful keynote speakers, fabulous lightning talks and the opportunity to present a workshop too. I was delighted to talk to librarians who I follow on Twitter who were great at coming up and saying hello. It was lovely to meet Lucy Atherton @Welly_Library, Sally Dring @dringo and Sarah Pavey @Sarahinthelib especially. To also reconnect with Terri McCargar @liberryan was lovely! We will have to present together again one day! 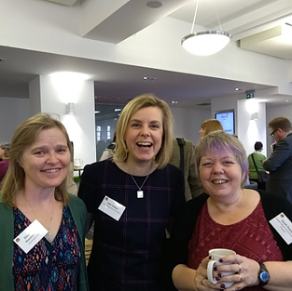 It was also a real pleasure to finally meet some of the JCS team who did a wonderful job of making themselves available, supportive and friendly throughout the whole conference. Finally, to meet Joyce Martin again was fabulous, she has a wonderful knack of making everyone she speaks to feel important. She must have been so busy but found time for everyone. Meeting Jane Secker @jsecker properly for the first time was a highlight as she has been a huge library hero of mine for years. 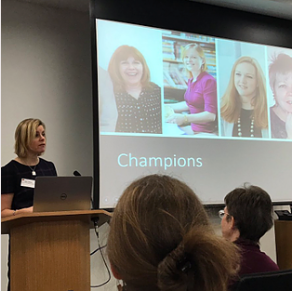 Luckily she warned me the night before that I may get a mention in her keynote but I was still shocked to see my face on one of her slides as a champion of school libraries alongside some of my own personal champions. There was so much to take away from this conference, so I will just share my highlights. 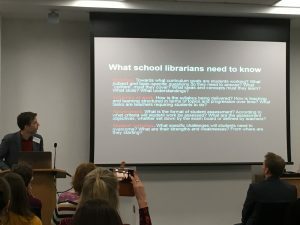 and finally The Liminal Library: Making Our Libraries Sites of Transformative Learning by Barbara Fister LILAC, Newcastle University, April 2015. Slides. Lynne talked about teaching information literacy to 6th formers. She shared her lessons structure including her online databases, research skills and referencing fundamental for academic honesty. I liked hearing what a school librarian can do if they are given the time. Regular sessions once a week seems to make a huge difference. Graham talked about the mindset of school librarians and the need for us to understand our role in the classroom as well as the library. Our route into collaboration is to start talking the way teachers talk and the way to do this is through understanding the syllabus, schemes of work, assessments and student variables. When marketing our skills we need to keep thinking about the ‘so what’. Teachers and students need to understand why these skills are important and what is in it for them. Using the buzz words that the students want to hear ‘fast’, ‘easy’, ‘convenient’, ‘marks’ is an easy route into the hearts and minds of our students and content curation for students should not be seen as spoon feeding but rather removing the obstacles to learning. Students can find information easily, it is now the understanding and using it that needs to be focused on. Students need to be encouraged to read for information. This is a skill that they losing due to information being so easily accessible so what can we do about this? Students need to support their ideas with research and are finding it more and more difficult to do this, how can we support? Hazel shared many interesting ideas but the information ladder to encourage and support reading around a subject is the real winner! 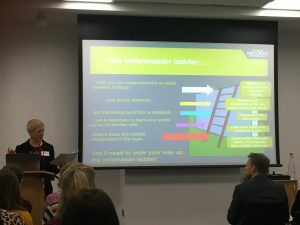 I enjoyed Donna’s straight talking presentation and knew from the start that it was going to be good from her ‘just in time rather than just in case mindset’ meaning that stand along information literacy lessons are unhelpful if the skill is then never used in class. It was good to hear her talk about the importance of teaching skills alongside the curriculum and throughout topics. She shared how using Google Docs made integrating into the school curriculum easier and helped students see her as teaching staff rather than support staff. One of her tricks when talking about picture content for Geography was to take the students profiles from Facebook and then show them how easy it was to take something that she did not have the right to take. When it was personal to the students the message was easier to get across. My favourite quote from this session was “We should not be teaching EPQ students how to reference. They should darn well know how to do it before that.” I absolutely agree! We need to be teaching referencing from year 7! Nikki shared the experience that school libraries in Australia are having and it should like the problems we are facing are shared. The issues we have been looking at today are the same the world over it seems. Australia has a similar campaign going to our #GreatSchoolLibraries campaign called #studentsneedschoollibraries. She shared a video that Softlink has produced to support our campaign here in the UK. It was great to share ideas with like minded people but we need to find a way to be inclusive and we need the state school librarians to be able to join us too. One idea suggested was teaming up of private school librarians with state schools and helping to support the cost. Helping to raise the understanding and importance of school librarians across all sectors is essential. Maybe we need to find a way to create a sponsored place or two for our state colleagues? One other small suggestion is that we have our Twitter names on our badges. It is easy to spot someone whose name and picture is up on Twitter like mine but for our school colleagues who tweet as a school and don’t have their picture up it is impossible to know who they are. The impact you can have via Twitter is immense. So many librarians know about what we are doing in Guernsey because of social media. 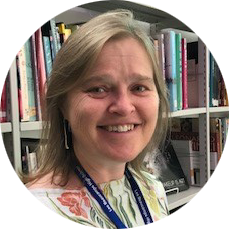 I was delighted to be walking across back to the conference centre with one librarian, Isobel Ramsden @violin_is who asked if I was Elizabeth Hutchinson, she told me that her Geography teacher had given her a copy of my latest article from UKedchat. This was great to hear as this means that my advocacy is going beyond the walls of the school librarian world, to the teachers. It was so important for me to hear this as it has inspired me to keep going, so thank you Isobel. I would highly recommend this conference as information literacy for school librarians is an essential part of what we do, we now have a conference for our sector so we should support it if we can. Thanks Joyce it was amazing! 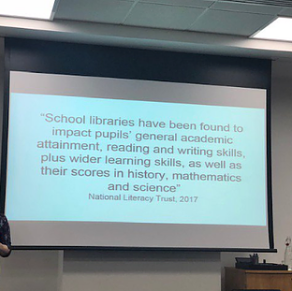 This post was first published on elizabethahutchinson.com/schoollibraries by Elizabeth Hutchinson on 01 December 2018. See the original post here. Republished with permission.